Paint circles around the back of the paper plate working inwards from red to orange to yellow to green to blue to purple. Leave to dry. Fold the plate in half (with the paint to the outside) and with strong glue stick milk bottle lids along the inside edge of the plate, making sure to leave a gap a couple of inches either side of the fold line. 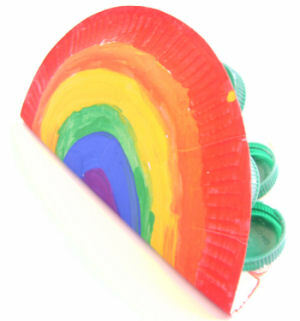 When the glue is dry, play your castanets by holding between your thumb and fingers and clicking together.